Now that the USCIS H1B 2016 selection is done, if you applied under the H1b Cap and did not get either a receipt or your checks have not been cashed, you have to come to terms that your case did not make it through the H1B lottery. This means that you need to find other options to remain or come to the United States. We have tried to analyze some of these options. 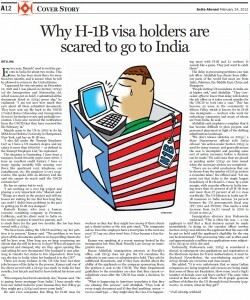 You need to research if the entity qualifies for such H1B visas. 5. If you are an Australian citizen, you can look into an E3 visa. 6. If you or your spouse is born outside India or China and qualify under Eb2 category, you can look at a straight green card process through labor certification, or national interest waiver. 8. If you have been victim or certain crimes, look into a U Visa. 9. If you are from a country which have a treaty with the United States, you should look into the E1, and E2 visa. There are many other options that might be available to you but until you look into them or assess them carefully, you will not be able to know what are your real options instead of the H1B visa. We recommend you talk to an experience lawyer to help. Feel free to call us at (510) 742 5887, should you have any questions.